(Clockwise) Iñaki Alday, Mirya Holman and Walter Isaacson. 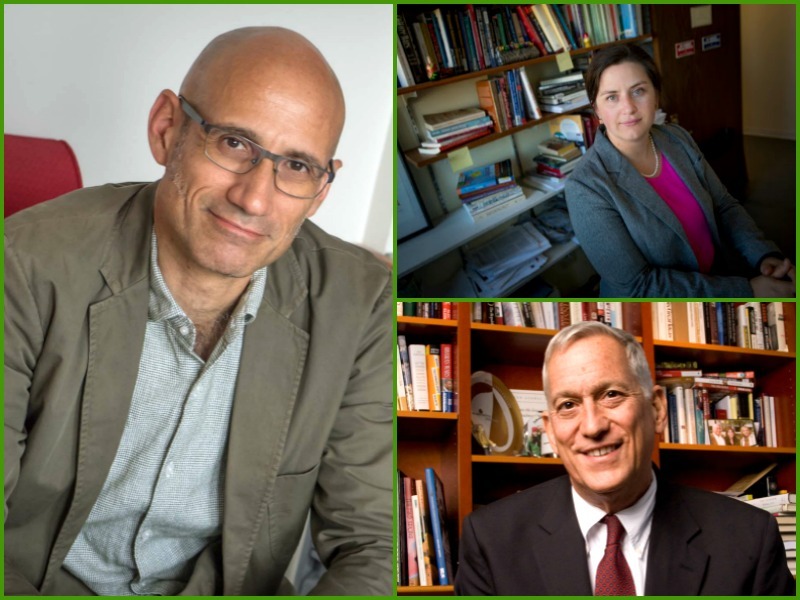 A distinguished architect who has spearheaded multi-disciplinary efforts to improve society’s relationship with the environment, a renowned political science professor who studies women and politics, and a former journalist widely regarded as the nation’s foremost public intellectual are all joining Tulane Law School as Affiliated Faculty. The three Tulane scholars, Iñaki Alday, Mirya Holman and Walter Isaacson, come with a wealth of expertise in a variety of disciplines that are increasingly important to the study of law. They will help build an interdisciplinary bridge across the campus for both research and teaching, said Law School Dean David Meyer. ● Alday is the Dean and Richard Koch Chair of Tulane’s School of Architecture. As a scholar, Alday is a founder and co-director of the Yamuna River Project, an inter-disciplinary project that aims to revitalize the ecology of the Yamuna River in New Delhi, India, and includes a collaboration between Tulane and the University of Virginia exploring similar urban river environments. The project draws on experts from architecture, law, engineering, geography, and coastal sciences, among other disciplines. ● Isaacson is a Tulane Professor of History. He is a former journalist, and a host of the show “Amanpour and Company” on PBS and CNN, a contributor to CNBC, and host of the podcast “Trailblazers, from Dell Technologies.” He is a past president and CEO of the Aspen Institute, where he is a Distinguished Fellow. Isaacson is one of the nation’s most prominent biographers and scholars of innovation. His acclaimed books include Leonardo da Vinci (2017); The Innovators: How a Group of Inventors, Hackers, Geniuses, and Geeks Created the Digital Revolution (2014); Steve Jobs (2011); Einstein: His Life and Universe (2007); Benjamin Franklin: An American Life (2003); and Henry Kissinger: A Biography (1992). As a journalist, Isaacson rose to become Managing Editor of Time magazine and CEO of CNN in 2001. He then served as President and CEO of the Aspen Institute from 2003 to 2018, before joining the faculty of Tulane University. This fall he will be teaching an undergraduate course in U.S. history and the law. Alday, Holman and Isaacson join the Law School’s five established Affiliated Faculty: Dennis Kehoe, Andrew W. Mellon Professor of the Humanities; Sally Kenney, Newcomb College Endowed Chair, Professor of Political Science, and Executive Director of the Newcomb College Institute; Nghana Lewis, Associate Professor of English and Louis & Leonard Riggio Professor of Social Entrepreneurship; Nancy Maveety, Professor of Political Science; and Steven Sheffrin, Professor of Economics and Executive Director of the Murphy Institute of Political Economy. "Our affiliated faculty have greatly enriched the law school in countless ways over the years, and they have also helped us engage with colleagues and collaborators across the university,” said Adam Feibelman, the Sumter Davis Marks Professor of Law and Associate Dean for Faculty Research. “These three new colleagues will certainly do both, and we are extremely fortunate to be able to include them in our ranks."